LipSense® and SeneGence® products are a trending, hot commodity in the makeup industry. If you’ve tried LipSense, fell absolutely in love, and want to share it with your friends, family, or even co-workers, then becoming a distributor may be the perfect opportunity for you! Choosing to become a distributor was one of the best life decisions I have ever made, and it could be yours too! While the story of how I became a LipSense distributor could have a whole blog to itself, I’ll keep this short and sweet. Just like many of you, I had heard about the company and products through the buzz; whether it was social media or talking with friends, LipSense always seemed to be a common trend. But in all honesty, it wasn’t the products that grabbed my attention. The business aspect of the company is what fascinated me most, but after learning more about the products and trying them myself, I fell absolutely in love! When I started in 2016, LipSense still wasn’t that well known, so — being the most confident I have ever been — I jumped in immediately and started spreading the word. Being a distributor has been an absolute blessing for my husband and I; I’ve received a car lease for a brand new 2017 Yukon, qualified for a tropical trip to Costa Rica, and am making some great money. Now is still a great time to jump on board, and becoming a distributor is super simple, just follow the guidelines below! Who Can Become A LipSense and SeneGence Distributor? Do you love high-quality makeup and other cosmetics? Do you need a part-time job? How about a full-time job? Or, maybe you’re looking for an opportunity to run your own business? Well, if you answered yes to any of the above, then being a distributor might just be your calling. When you’re ready to become a SeneGence distributor, you’ll first start with a distributor application. Don’t worry; it’s very brief! You’ll be on my team and I’ll do everything I can to help you get a successful business up and running. You’ll also have to pay a small annual fee of $55 and complete your contact information. After submitting the application, you’ll soon receive an email with your distributor ID and password, and whala! You’re officially a SeneGence Distributor! Order products at a 20 percent to 50 percent discount! Sell LipSense and SeneGence products to whoever, at a 50 percent profit! Build your own team and start earning commissions and income! Honestly, LipSense LipColor and glosses sell themselves; as long lasting, vegan, gmo-free, smudge and kiss proof, wax free, not tested on animals, waterproof, gluten and lead-free lipstick… ladies usually don’t blink twice. Making sales is easy, but the way you approach it is entirely up to you! Whether you want to sell in person to friends, family, and co-workers, you prefer selling through social media channels like Facebook, Twitter, and Instagram, or both, selling should be a breeze! You can take orders online, too, whether you invest in a SeneSite or take orders through online messaging. 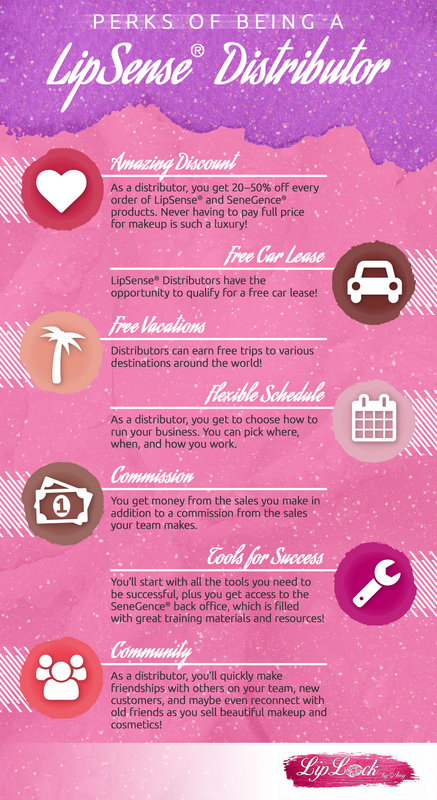 If you’re still unsure about becoming a LipSense distributor, feel free to reach out to me! I will share my experiences with you and answer any questions you have! If you do sign up, get in touch with me, and I’ll add you to the team and introduce you to other members! Then I’ll work with you and provide you with the tools you need to be successful! Becoming a distributor for this company has been one of the best decisions I have ever made, I know it will be for you, too! To learn more about joining my team and becoming a distributor, click here!